The following operating guidelines and proposed bandplan are designed to enable the most efficient use of the 8MHz wide transponder for all users. It is expected that these initial guidelines will be further developed after commissioning. As a general principle, the transponder should be only be used for short-duration tests and contacts. The TV beacon channel uplinked from Qatar or Bochum. The relaying of terrestrial Amateur TV Repeaters is discouraged unless the content is of exceptional amateur radio interest. All uplink transmissions should use the minimum power possible. 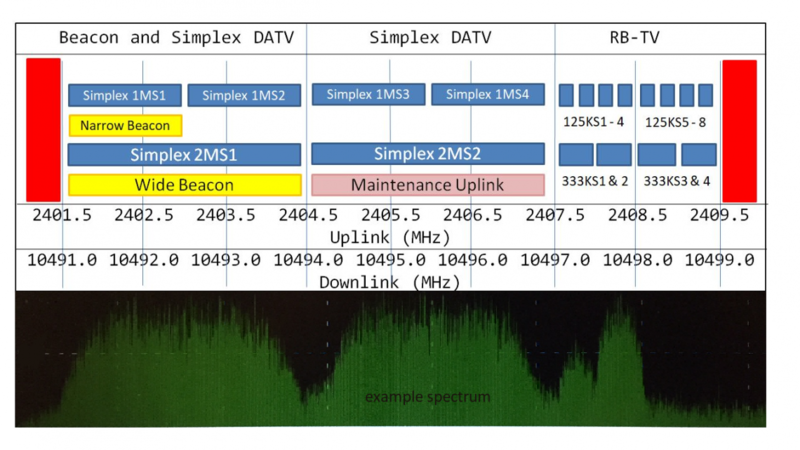 No transmissions should have a downlink signal with a higher power density than the Beacon – the web-based spectrum monitor will enable users to set their uplink power to achieve this. 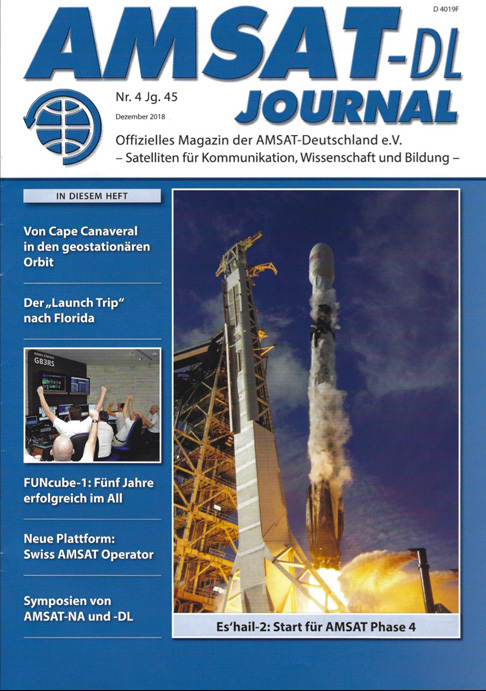 Transmissions should use DVB-S2 where possible. For normal standard definition transmissions, 2 MS is the maximum symbol rate that should be used. To enable easy decoding PIDs should be set as: Video 256, Audio, 257, PMT 32 or 4095, PCR 256 or 258. Service Name should be set to CallSign. PMT PIDs 4000 – 4010 should not be used. Users are encouraged to experiment with higher-order DVB-S2 modes at lower symbol rates (for example 333 KS 32APSK) to conserve bandwidth for other users. On Wednesdays (UTC time), experimenters are encouraged to try other modes – perhaps 6 MS using the whole transponder for brief (less than 10 minute) periods. It is essential that users to announce their plans on the chat room page, and to always monitor it. The beacon will initially run 24/7, but it is anticipated that, as more users become active, this will be reduced to a shorter period every hour. 1. The maintenance uplink will only be used very occasionally, but users are requested to give it absolute priority when notified. 2. DVB-S2 users are requested to use the steepest roll-off that their equipment is capable of to reduce the possibility of adjacent channel interference. 4. Uplink 2401.5 – 2409.5 RHCP, Downlink 10491 – 10499 Horizontal.